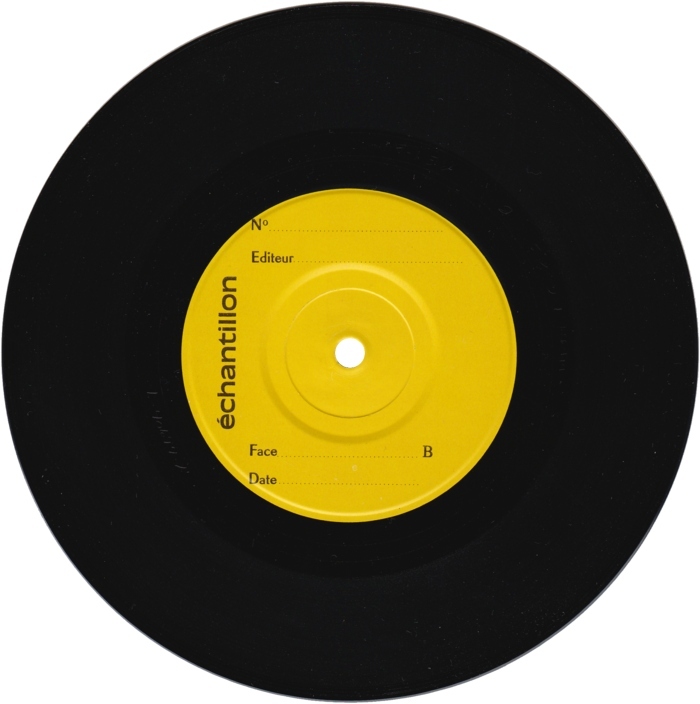 Black vinyl with yellow generic "Échantillion" labels, which is French for "sample". The records came in white inner sleeves with a release information sticker from the company that organized the manufacturing and distribution in Europe, Southern Studios Ltd. The retail singles were only pressed on blue vinyl. The lacquers were cut in USA by an unspecified company. The first cut of side B must have been unsuccsessful, determined from "RE1", which means recut 1. 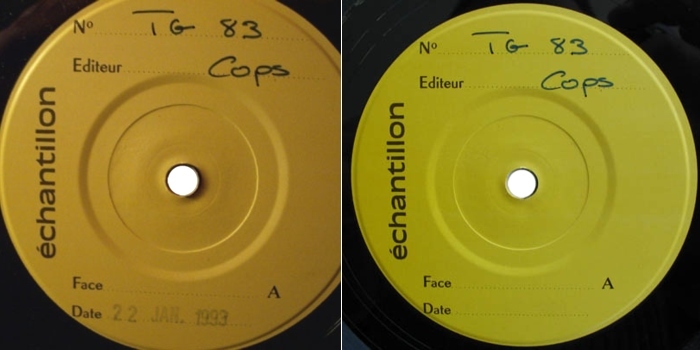 The father and mother plates were made by Lee Plating in USA, which added the L-codes to the lacquers before doing so, as the L-codes are just as deep as the lacquer etchings by the mastering company. 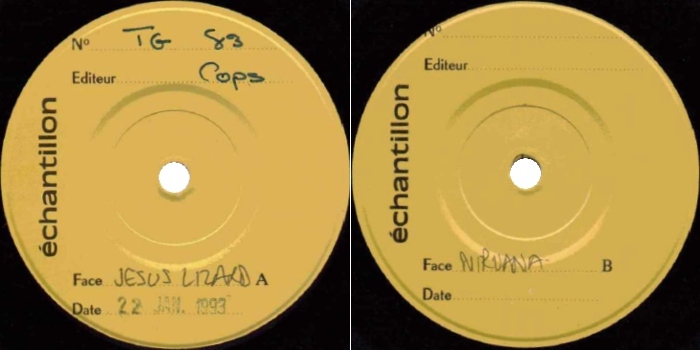 Southern Studios contracted Cops to arrange the manufacturing , and they had the records pressed by DFI in France. DFI added the "DFI -93-1" parts to the mothers before creating the stampers. So far six copies have been found. 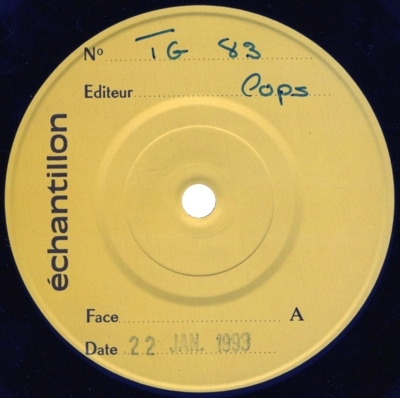 "TG83" and "Cops" are handwritten in blue pen on side A on all of them. 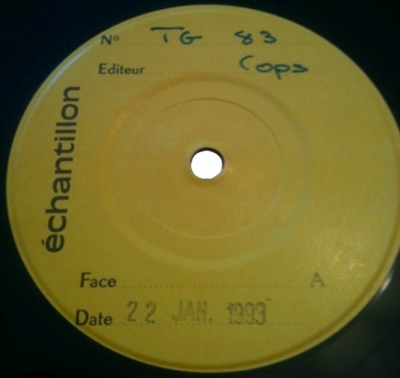 The date "22 JAN. 1993", exactly one month before the retail single was released, was stamped on side A on all copies, though it has almost entirely disappeared on copy 2. Copies 2 and 3 came from a Southern Studios ex-employee. According to him, five or six may have been made. 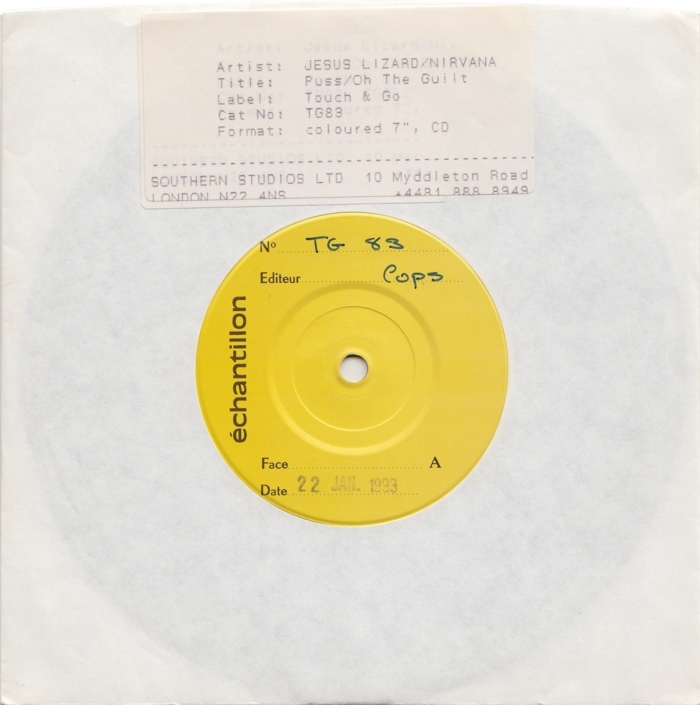 Copy 4 also has handwritten band names on both sides, which appears to have been written with a different pen. This came with a letter and a press release. 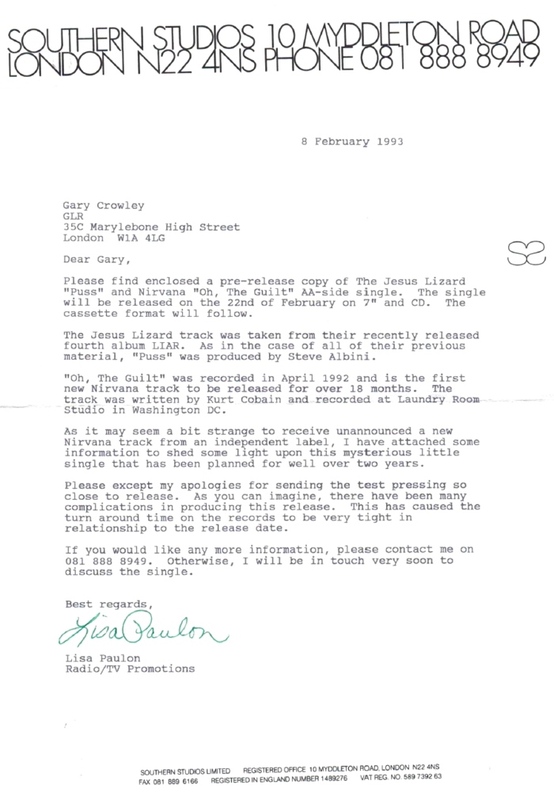 The letter was addressed to Gary Crowley, a DJ on Greater London Radio, now BBC London, and was sent by a TV and radio promotions representative at Southern Studios. 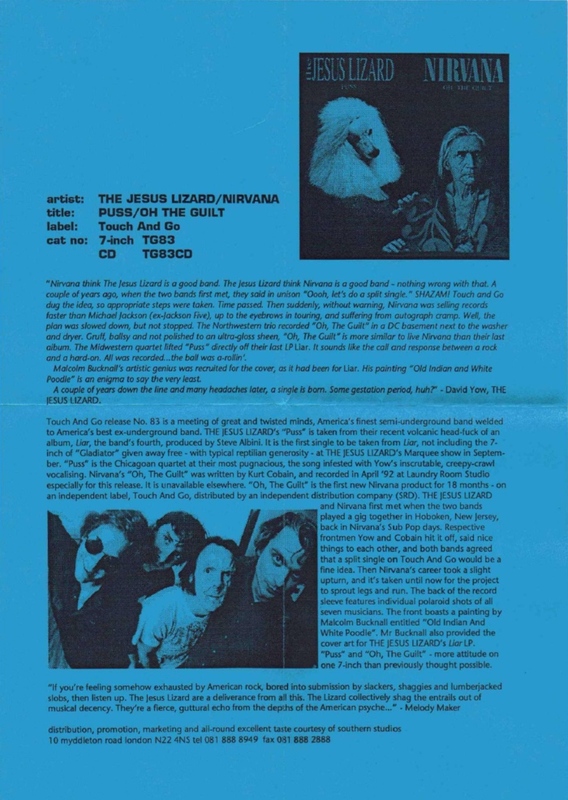 The blue press release contains general information about the release, and has much of the same text as a white press release which once came with a retail 7" used for promotion. (The blue press release has also been found with a retail CD used for promotion.) 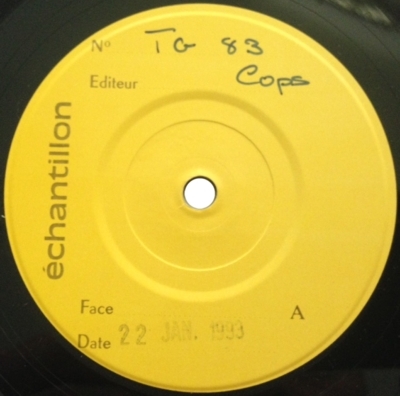 This particular copy was used for radio promotion, which explains the addition of the band names on the labels for Crowley's convenience. 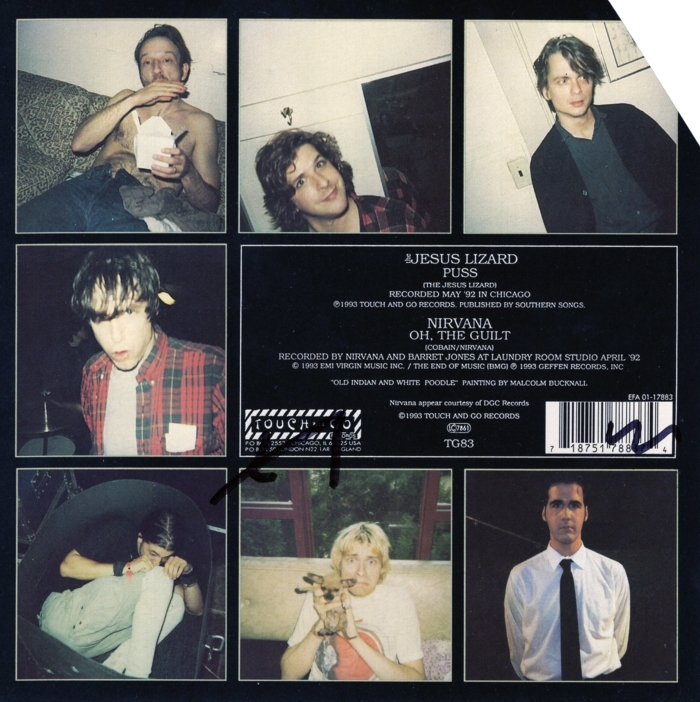 The fifth copy came without the inner sleeve with sticker, but in a normal retail sleeve with a cutout corner and various scribbles. 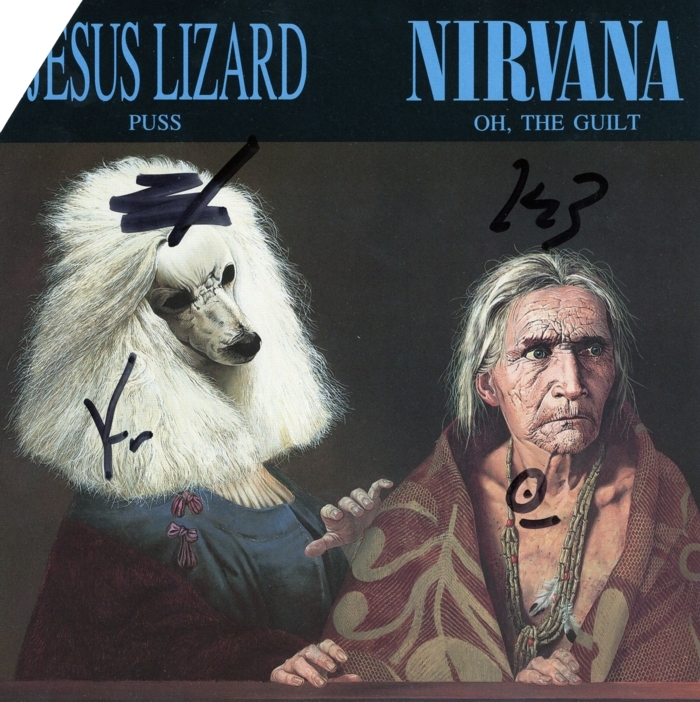 It was picked up in the Southern Records offices by a member of a band signed to the label. 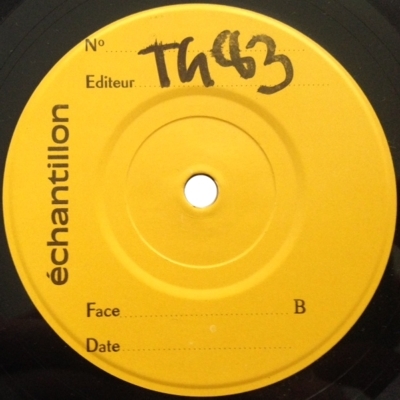 The sixth copy seems to be missing the original inner sleeve with the sticker.